Federico Marchetti’s misery has pretty much ended today as he finally move from Cagliari and signed with Lazio for a fee around 5,2 million ending some speculation stating that he might go to Ac Milan instead. Marchetti already arrived in Rome earlier today for completing his medical and has pretty much become the Biancolesti’s new singing as the player already confirmed about his joy in completing a move to the capital club. The keeper who hasn’t played any football since the 2010 World Cup because being frozen out by his previous club’s president, Massimo Cellino, expressed his delight by stating that singing with Lazio has ended his nightmare. Marchetti also added that the reason he finally chose the Biancocelesti is simply because the capital club’s project is very promising and it’s pretty much visible in their current rapid move in the summer transfer market. “I’m happy to be here. 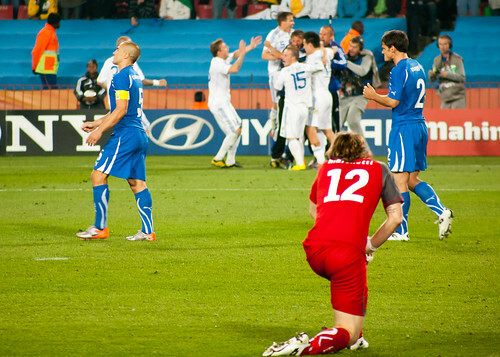 It’d be great to play football again – it’s the end of a nightmare. I have always trained with consistency and I’m happy that President Claudio Lotito and Lazio believed in me. I instantly had faith in the Lazio project and I fully supported the move, “ Marchetti stated. The 28-years-old keeper also promised Lazio fans that he will try his best in rediscovering his best form that made him get a called up for the Italian national team in the last World Cup. Being set as the replacement for the Biancocelesti’s previous number one, Federico Muslera, Marchetti seems confident as he stated that he will give everything so he can get another Azzurri call up for the upcoming Euro 2012. It’s the European Championship next summer and I’d like to be there with Italy. I want to do well for that reason too,” Marchetti added.